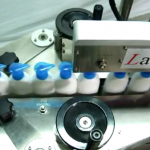 A LabelOn™ Modular Label Applicator set up for flat sided product labeling requirements can be counted to have superb accuracy and straightforward settings. Flat sided products requiring on up to three labels is painless to set up again and again where all electronic settings/parameters of your production job can be saved on the touch screen allowing exact repeatability between runs. Variation in bottle shapes and heights have been given particular consideration. Having an option to add more modules, your labeling machine has the ability to change from flat to oval to round product label application job very quickly and easily. To align oval bottles for a steady movement past the labeling heads they need more than guide rails. An oval bottle is free to rotate with only one point of contact on the radius of each side that can lead to substantial label placement variations with probable creasing during wipe down. To deliver significant amount of alignment, we need the Aligning Chains module. This commonly employed strategy provide significant amount of alignment for a range of oval products without having to change parts. 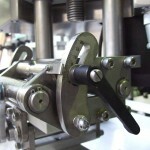 A number of options are available to align such oval cross section bottles and these can include: dual scrolls, reciprocating clamps, aligning chains, aligning wheels and conveyor pucks.. 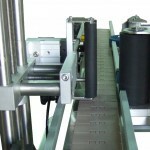 Frequent application of the LabelOn™ Modular Top and Bottom configuration is the labeling of products from above and labeling from below simultaneously. This is excellent for labeling tubs and jars, lay flat goods like chipboard, books, DVDs or boxes. It is very convenient for adding product identification, nutritional values, warnings or allergen labels. 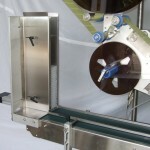 It can be a label only from top or bottom, though in some cases, self adhesive labels are applied from both. The pressure sensitive labels can be nearly the diameter of the product or they can be very small as is the case for over labeling of imported products.